Oh boy, I am such a slowpoke. Always trying to take it in to the fullest. And then I get dragged elsewhere to do it again. Let me admit it freely: I am on my third character in The Secret World. I started out with a Dragon, but got myself frustrated when I stepped seriously under powered into the Blue Mountains. So I tried an Illuminati while also working toward a new ranged spec. That got me even into the desert, but I skipped some content in the Blue Mountains. And then comes the free trial weekend and increased activity among my blogger friends Kadomi, Belghast, Syl and Shadowspawned. Not to mention Rowan who tells us to never reroll our characters. I even told Kadomi not to reroll (if she likes her faction). Trouble was, the majority of their guild was Templars. Well, this forced me to roll a Templar. Now I am at the Innsmouth Academy for the third time around. But this time Carter will talk to me. Funcom announced the next content patch for the end of August with more missions, the introduction of the auxiliary weapon slot using a handy rocket launcher, a plastic surgeon and a hair and makeup stylist. Follow the link to the newsletter for TSW Issue 2. I’ve barely scratched the new content from Issue #1, how can I expect to stay on top of all this if it comes out this fast. Plus, there will be another free weekend starting August, 15th. Funcom published their quarterly reports recently and had to tell their investors that results had come in below expectations. In my opinion it’s a case of to high expectations. They’ve made a wonderful and intelligent game, but it is a niche game, considering the difficulty levels at times. The good thing is, they act on it by introducing the trial weekends. And I for one can tell you that they are successful doing so. You’ve seen I’ve posted 5 spoiler quest guides (can’t keep up with those, either). Those quest guides have increased my visitor numbers significantly, but fell off as soon as the majority of players moved away from Kingsmouth. During the free trial, that number climbed to about 45% of the peek and is now one week after the trial at 3 times the number of visitors just before the trial. Since there have been so many positive reviews from the trial weekend, I expect a pretty solid number of participants and subsequently, a good number of new subscribers. Of course they set the trial weekend just before the GW2 rollout, otherwise, they’d probably have to wait for 3-6 more weeks. It’s business after all. And they seem to have business sense. Nothing wrong with that. 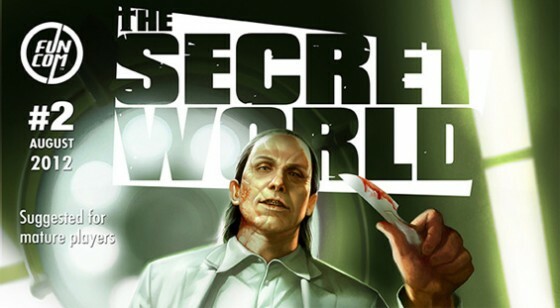 "The Secret World" is a registered trademark of Funcom GmbH. All logos, images and names are intellectual properties of Funcom GmBH unless otherwise noted. This site is not endorsed by or affiliated with Funcom GmbH. Dont worry, I’m on my first character and I’m only in BM. I’ve taken 2 weeks off now because I’ve been horribly busy with school starting for my kids and work being a bear. I’m going to try to get back into it next week. Oh, I don’t really worry about not being able to keep up. It’s a game, after all. It comes down to the good old saying “So many things, so little time”. GW2 is coming out in 10 days, Vanguard has gone F2P and the Pandas are on the horizon. I got the exact experience with The secret world really.